If you would like to be notified of updates at Unlikely Stories, join the Yahoo Group. You're at unlikelystories.org. If you're looking for UNLIKELY STORIES: The Cartoon, head for www.UnlikelyStories.com. 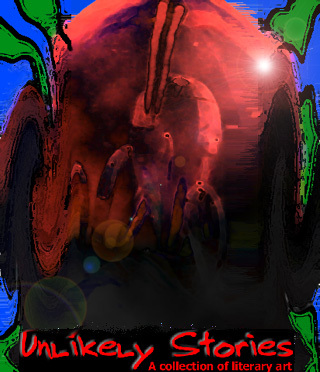 Unlikely Stories is edited by Jonathan Penton. This issue was put together with the invaluable help of Sylvia Pedroza. Portions of this web site are best viewed at a resolution of 1024x768. A statistically shrinking number of pages look good at 800x600 or greater. Please note that we are irresponsible for any offense caused by this site. All authors featured on this web site retain full copyrights to their work. "Cover" image is copyright Robert LeSant. All rights reserved. Violators will be persecuted. Unlikely Stories is the proud recipient of the Poetry SuperHighway 2001 Editor's Choice Award and The Poet Watch's Poet's Award.